Seo, Y., Ide, K., Kitahata, N., Kuchitsu, K. and Dowaki, K. 2017. Environmental impact and nutritional improvement of elevated CO2 treatment: A case study of spinach production. Sustainability 9: 1854; doi:10.3390/su9101854. In providing the rationale for their work, Seo et al. (2017) state that it was their aim to "prove the effectiveness of elevated CO2 treatment on leafy vegetables in a protected horticulture system." This objective was accomplished by performing a growth experiment in a controlled-environment laboratory using spinach (Spinacia oleracea) plants that were germinated in pots and grown for 20 days under either ambient (400 ppm) or elevated (1000 ppm) CO2 concentrations. Then, following the cultivation period, the authors measured the weight and vitamin C concentration of the plants growing in each treatment. And what did those measurements reveal? As reported by the authors, the results indicated that the average weight per bouquet of spinach in the ambient CO2 treatment was 1.59 g, whereas in the elevated CO2 treatment it was 2.70 g, or 1.69 times higher. With respect to vitamin C, Seo et al. 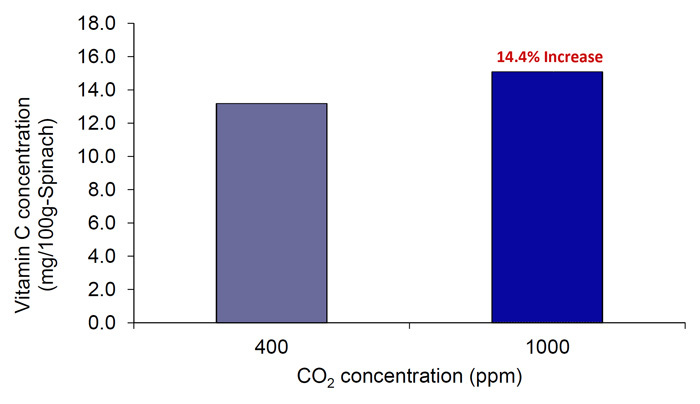 report that the average concentration in the 400 ppm CO2 treatment was 13.2 mg/100 g spinach, but rose by 14% to 15.1 mg/100 g in the 1000 ppm CO2 environment (see figure below). Thus, not only did elevated CO2 improve the quantity of spinach produced (relative to ambient CO2 concentration), it also improved its quality -- a fact not lost on the five Japanese researchers, who concluded that future increases in atmospheric CO2 "could enhance [the] growth and nutritional value of spinach." Figure 1. Average vitamin C concentration of spinach grown under CO2 environments of 400 and 1000 ppm for 20 days in a controlled-chamber environment. Source: Seo et al. (2017).